Profoundly Gifted: You did some amazing things and some impressive actions when you were a child prodigy; have you been up to anything since then? Profoundly Gifted: That’s it? You haven’t studied languages, for instance? Maximos: Much water will not be able to quench love, and rivers shall not drown it; that is the important one, but yes; other languages are a bit like Scotch. One is just getting started; two is just about perfect; three is not nearly half enough. Profoundly Gifted: So you’re not just a husband and father: you’re also a philologist—how many languages do you know? Maximos: You are paying attention to trivialities if you gloss over my fatherhood to ask a question about my love of languages that I really can’t answer. Profoundly Gifted:What can’t you answer about how many languages your love of languages includes? Maximos: You aren’t a philologist when you speak two languages, or four, or twelve, or eight. You’re a philologist when someone asks you how many languages you know, and you have no idea how to answer. Profoundly Gifted: Then what is it? What should I make of it? Maximos: If I may shanghai an opportunity to follow the words, “If there is an elephant in the room, introduce him…”? Profoundly Gifted: It’s kind of like profound giftedness, no? The root problem, which I will get to in a minute, is that when people who are happy to have an Asperger’s diagnosis and happy to offer half the people they know an Asperger’s diagnosis, there are superficial similarities between profound giftedness and Asperger’s traits, things that a competent diagnostician should see far past. Early in the title, Attwood says that when he diagnoses someone with Asperger’s, he says, “Congratulations! You have Asperger’s!” But then it goes downhill. Atwood argues that the obvious social impairments one would associate with Asperger’s are guilty as charged; Asperger’s people don’t know (without counseling and / or training) how to hold an appropriate social conversation. However, the strengths one would associate with Asperger’s are all but eviscerated. Asperger’s children may have a monologue that sounds like a competent adult discussing the matter, but this “knowledge” is a hollow shell, without much of anything of the deeper competency one would associate with an adult capable of such monologue. The common stereotype of Asperger’s patients portrays a slightly odd combination of strengths and weaknesses; Attwood’s book is less generous and really only ascribes real weaknesses. Profoundly Gifted: Is the question “Asperger’s or profound giftedness?” the sort of question you’d rather un-ask than answer? A much better interpretation of Attwood’s data might come from splitting the theory of other minds into a separate theory of like minds, and also a theory of alien minds. A theory of like minds works with one’s homeys or peeps; hence someone IQ-normal and autism-normal surrounded by IQ-normal and autism-normal classmates will coast on a theory of like minds. But, except in how it may be refined by practice, a theory of like minds that comes virtually free to everyone isn’t in particular reserved to a majority of people (not) affected by XYZ condition. With some true exceptions like Tay-Sachs, everybody gets along with their peeps. Gifted and profoundly gifted click with their fellows; Asperger’s people click with their fellows; to pick a few many demographics, various geek subcultures, codependents, addicts, and various strains of queer should click just as well. Everybody gets a theory of like minds virtually free; the breadth of usefulness depends on how rarely or commonly one encounters like minds, and this heavily loads the dice for Attwood’s approach. The comparison Attwood makes in interaction with autism-normal people loads the dice in a way that is totally unfair. The comparison is autism-normals’ theory of like minds to Asperger’s theory of alien minds; he never, ever tests autism-normals on their ability to relate to alien minds, nor does he ever test Asperger’s patients on their ability to relate to like minds. And while being unsure about how far this applies to IQ-normal Asperger’s patients, Asperger’s patients often make herculean and lifelong efforts to develop “theory of alien minds” aptitude, and the result is not just that they connect, perhaps clumsily, with people of the same age and socioeconomic status; they make very close connections across age, race, and gender, and for that matter animals who may start off by being afraid of them. The theory of alien minds is finely honed, even if it is not a valid substitute for a theory of like minds, and once it is honed, this theory of alien minds reaches much, much further than autism-normals resting on a theory of like minds. 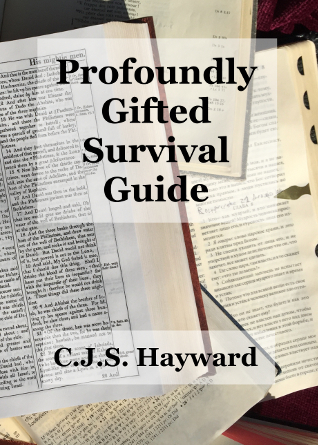 Profoundly Gifted: So your parents’ policy of non-interference and the Law of the Jungle was too romantic to teach you to be safe? Maximos: More romantic than real life, perhaps, and putting me into a regular kindergarten, sink or swim, is neither more nor less realistic as putting a rabbit in the midst of coyotes, sink or swim. There was a real solution, but it was more romantic, and I fear being misunderstood. I certainly found it by accident. Profoundly Gifted: What is it? Maximos: A woman has kept a goldfish for years longer than goldfish usually live, in a fishbowl, just by talking to it in Mommy-to-baby love. Years back, hospitals which were ever concerned with sanitation witnessed a dramatic drop in infant mortality when they took the “unsanitary” step of having old women cuddle them. Profoundly Gifted: And how does this relate to bullying? Maximos: Let me raise and address another question first. We raise and send constant signals which are often met with escalation. When we are angry with someone, or wish for a way out of our job, or anything else, we war against others in our thoughts. That warfare is powerful. Often it comes back amplified; we can feed a corrective to the loop by responding meekly and with meek thoughts to a blast of anger. Some martial artists have talked about how few people really want to fight; such people are much less common than people who want to be the unchallenged tough guy. It does happen that there are some people want to do wrong; however, much more common are people who are disarmed when all three claims in Anger slays even wise men; yet a submissive answer turns away wrath: but a grievous word stirs up anger. The submissive answer to domineering anger is difficult, but it is possible, and it is a route that a quest for life by the Law of the Jungle will never find. And bullying isn’t just for in the classroom. It’s also in professional life. The top quality I search for in a boss is humility. There is something aggravating about high talent. It is common practice to have sent multiple C&D letters, or equivalent, when harassment has continued after being repeatedly told, “No.” This is unfortunate, but it is a non-negotiable feature of the landscape. It is possible, in good faith, to do one’s best work as the privilege of the inferior before the superior to be praised, in the purest thoughts of respect, and instead be met with anger and retaliation to a perceived challenge. But if this is a live danger if we meet our bosses with thoughts of peacefulness, what on earth is to be done when we throw down work with warfare in our thoughts? Profoundly Gifted: But don’t we all do best to avoid needlessly stepping on other people’s feet, especially our bosses’? Profoundly Gifted: Yes and NO? Maximos: Have you ever spent a winter in the Midwest, perhaps Illinois? And drove after a heavy snowfall, three to four inches of packing snow? Profoundly Gifted: Yes; it was a bit harrowing, but I made a bit of extra effort and was overall pretty safe. Maximos: What made you safe? Profoundly Gifted: I drove slowly, left plenty of space, and made allowances for skidding. That was enough to have me relatively safe. Maximos: Ever driven in that kind of snowstorm in Georgia and the US South? The same three or four inches? Profoundly Gifted: Not really; it never snowed like that when I was there. Maximos: Years back, Georgia responded to a snowstorm three or four inches deep, and decided, “We will not be caught off guard like this again.” And then the next snowstorm the slowplows were rusted to the point of being unusuable, and you would have been sharing the road with people who don’t have even an Illinois familiarity with driving under heavy snow. Would you consider yourself safe all the same, because you need to drive in snow? Maximos: Get used to driving in a blizzard with other people not used to driving in any snow, if you want to be profoundly gifted. The approach that is usually safe sharing the road with drivers who can handle snow, more or less, does not even compare to trying to be safe hanling a road with people who just don’t know how to drive heavy snow. And it feels awfully good to be told more than once, “You are the most brilliant person I’ve ever met,” but suppose you are so bright that the average Oxford PhD has never met someone as talented as you? You may be trying to drive safely yourself at least, but you’re sharing the road with people who are driving on a complete snow-packed terra incognita to them. Profoundly Gifted: This sounds like a lonely and sad life. Maximos: That was not my point at all, but what life is sad and lonely when one is searching for humility? But let me give another detail. You know, probably ad nauseum, about Leta Hollingsworth’s conception of “socially optimum intelligence”. The top end of the range varies somewhat depending on who you ask, but it runs something like 120 to 150. At that point you have powers to speak of, but you’re still running on the same chassis. And people who are properly above the range are rare, enough to really be exotic or a purple squirrel or something else few people have seen. The powers that come seem almost magical, but the price tag is hefty; the real advantage and the real privilege is at the heart of the gifted range, not the upper extreme. …Maybe you think I should be doing something more exalted in academia, and maybe I should be, but a humble and gentle boss is a treasure worth gold, and turf wars are just a little less than with academic bullies. Right now I have my wife and our seven daughters, and a steady job, and godliness with contentment is great gain. Profoundly Gifted: Well, that about says it. Sweet lord, I have played thee false. You don’t know how I was at a rich kids’ school, and the one and only chapel message I heard on theology of play was students who had gone through internships in third world nations, and theology of joy and play was writ large: a girl asked how you talk about germ theory to a runny-nosed little girl who offered you a lick of her lollipop. And really, how can you to people who are poor enough to be happy? You do not know the time when I was deathly ill and was healed You do not know when I met every earthly betrayal and dishonor, and none to my own credit knew Heavenly honor next to which the summit of earthly honor is but pale and shadow. You do not know the sound of men weeping when the sleeper awakes, and the dreams are gone: the apprenticeship is finished and the godhead begins. You know I have felt sorrows above anything mentioned here, but they are not worth comparing with the glory to come, or even for the glory that exists here now in the the vast, vast open freedom of forgiveness, the utter nakedness of standing open before God, and the priceless vale of humility that is so low that no man can fall from it. We, like social Gospel and the liberal left, believe in life before death. Eye hath not seen, nor ear heard, neither have entered into the heart of man, the things which here now God worketh in hidden transcendent glory for those who love him. Next Next post: QUICK! What Is Your Opinion About Chemistry?